SAN DIEGO – Peleliu Amphibious Ready Group (PELARG) and 15th Marine Expeditionary Unit (MEU) are scheduled to depart Naval Base San Diego on Sept. 17 for a regularly scheduled deployment to the Western Pacific and Middle East. 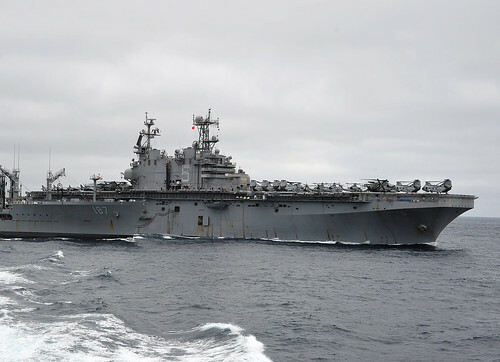 Nearly 4,000 Sailors and Marines will deploy with the ARG/MEU aboard USS Peleliu (LHA 5), USS Green Bay (LPD 20), and USS Rushmore (LSD 47). The ships have been trained and prepared to conduct a wide range of military and expeditionary operations globally. The ARG-MEU team is a versatile force. Using a combination of rotary and fixed wing aircraft, and amphibious landing craft, they can project combat power ashore in response to many events. The ARG is commanded by Commodore Mark Sakaguchi, Commander, Amphibious Squadron (PHIBRON) 3 and is comprised of the amphibious assault ship USS Peleliu (LHA 5), amphibious transport dock ship USS Green Bay (LPD 20), the amphibious dock landing ship USS Rushmore (LSD 47); support elements from Fleet Surgical Team 1, Helicopter Sea Combat Squadron (HSC) 23, Assault Craft Units (ACU) 1 and ACU 5, and Beach Master Unit (BMU) 1. The MEU, a Marine Air-Ground Task Force, is commanded by a Command Element and includes Battalion Landing Team 3/5, Marine Medium Helicopter Squadron 364 (Reinforced) and Combat Logistics Battalion 15. PELARG and 15th MEU recently completed an extensive nine-month period of integrated training ashore and at-sea to prepare them for maritime and theater security operations, humanitarian, and combat operations ashore. Both Composite Training Unit Exercise (COMPTUEX) and Certification Exercise (CERTEX) were successfully conducted at sea in July and August. Both exercises are meant to rigorously evaluate the readiness of the Navy and Marine Corps teams’ ability to conduct military and amphibious operations at sea and ashore leading to the ARG/MEU’s final certification for deployment.